Segment makes it easy to send your data to Hull (and lots of other destinations). Once you've tracked your data through our open source libraries we'll translate and route your data to Hull in the format they understand. Learn more about how to use Hull with Segment. Hull is the one place to collect, transform, enrich, filter, search and segment customer data in all your tools. It helps you creates a single actionable profile and uniform segments that sync to all your tools and make cross-channel, end-to-end personalization easy. Install the Segment Ship on your organization. If you just installed Hull, click on “Add a ship” on the overview page. Pick the Segment Ship from the list. Paste it into your destinations page. Alternatively, just click the “Enable with Segment” button. 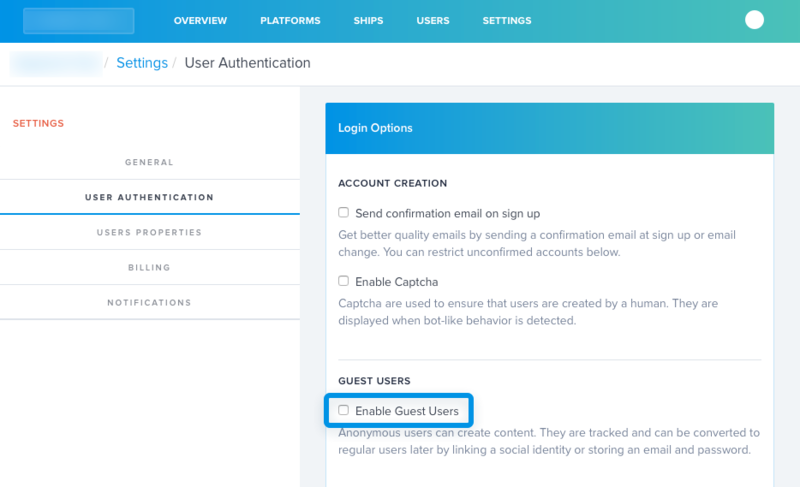 Enable Guest Users in your Dashboard’s Settings > User Authentication > Login Options. This will create users for each identify call, even those without a User ID which is useful to track Leads. This is disabled by default because it can greatly increase the number of users in your database. When enabled, users will be tracked from their very first visit and action, allowing you to build segments based on complete customer journeys. "groupId": "user's group Id if he has one"
In the Ship settings, you can choose which traits are sent to Segment.com. This lets you send any trait that has been computed or collected from enrichment steps to other tools. You can also filter in the Ship Settings the customer segments will be sent back to Segment.com to those matching one or more of your Hull segments. Hull supports the identify, page, screen, track, and group methods. Hull stores customer properties and events and makes them available for segmentation in the Dashboard. From there you can create and save audiences, transform and enrich customer data with Ships. Every user identified on Segment with a userId will be created as a User on Hull. Segment’s userId will be mapped to Hull’s external_id field. All other attributes from the identify call will be stored as custom traits on Hull. Every track in Segment will create a new Event on Hull with "source":"segment". Every screen in Segment will create a new Event on Hull with "source":"segment" and "event":"screen". Every page in Segment will create a new Event on Hull with "source":"segment" and "event":"page". Group calls in Segment will apply the group’s traits as traits on the users that belong to the group. Note: This feature is optional and not enabled by default. You should only enable it if your users can only belong to one group.